A film that qualifies as a Travelogue Documentary in that it contains footage of world-famous race tracks such as England's Ascot, Palermo in South America, and Churchill Downs, Jamaica, Aqueduct, Hollywood Park, Santa Anita, Belmont, Hialeah, Arlington and Saratoga in the United States, and since it begins in London in 1938, the Coronation of the King. 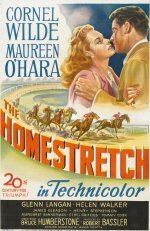 Jock Wallace, an easy-going and rootless horse lover, is taken to task by Leslie Hale, who thinks he has swindled her Aunt Helen on the purchase of a horse. He finds out that she is engaged to Bill Van Dyke, a young diplomat, and follows her to London , entering the horse he acquired from Aunt Helen in the famed Ascot Gold Cup. Jock and Leslie fall in love and are married on a boat to South America. In Buenos Aires, Leslie is jealous of Kitty Brant, an old flame of Jock's. Leslie wants Jock to settle down on his Maryland farm to raise and sell race horses, but he has too much gypsy in his blood and wants to follow the race-track circuit. They separate and he gives Leslie the horse that brought them together, and he hits the road. Leslie and old-time trainer "Doc" Ellbourne then proceed to win race after race with the horse. Jock, contrite and converted, returns to his old homestead and begins training another horse. Will his horse beat her horse? The volume is slightly low on this movie so you will need to turn it up a bit and because of it's age and rarity the colour is a little washed.